Unbeatable Million Dollar Views! 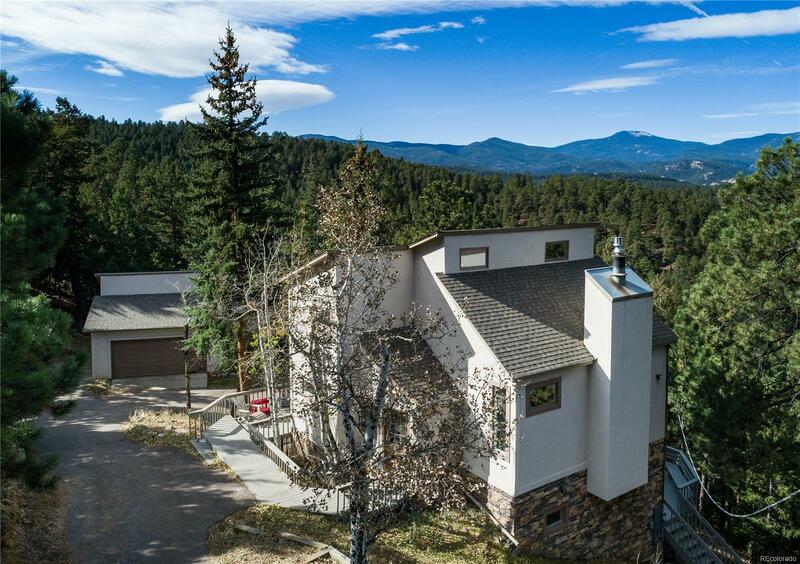 Over $32K spent on extensive window replacement on south/west sides with high-end Pella wood windows including shades between the glass that allow you to enjoy the panoramic mountain views. Drenched in natural light, the dramatic vaults give this home a contemporary, airy feel. Bamboo hardwood floors throughout main level. Quality finishes in the kitchen include built-in refrigerator, double oven, gas range, granite counters, a large island and solid wood cabinets. Lovely stone hearth and gas fireplace, and a spacious dining area round out the main level. The entire upper level is a private master suite with huge walk-in closet/dressing room, luxurious 5-piece bath and bright bedroom. Fully finished walkout basement features 2 bedrooms with custom closets, a shared full bath and family room. Large decks on main and lower level and stucco exterior. O/S 2-car garage w/ storage above. Quite and private wooded 2 acre lot, short drive from the highway!